Flat Bonnie x Nathan Hamill have made Octopop Plush! Purchase your new Nathan Hamill Octopup Sofubi for 10$ at 3DRETRO Booth 5049. Lucky buyers will receive an aqua "golden ticket"! Present it to 3DRETRO and you will be gifted one of three 6" Octopup Plush. Find more info about the Sofubi here. at Comic-Con San Diego (Giant Robot booth #1729). Sparq the Baby Dragon, will make his public debut at Comic-Con. Other color variations will be available online after Comic-Con. 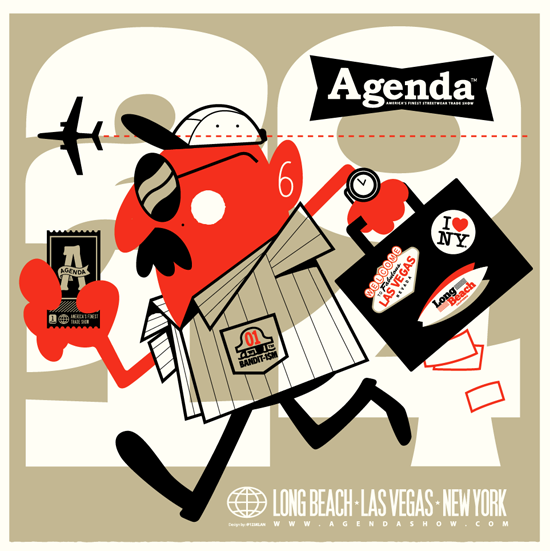 Just got back from Long Beach California, where we launched for the first time our brand BANDIT-1$M at the Agenda Show. So yes it's official BANDIT-1$M goes on wholesale now! After the show, We find some extra time to do a quick piece with Slick, Cook and Brisk. Thanks to Cale K2S and Justin Bua for the wall and the paint supplies. First come will receive free goodies! I'm planning on crashing their booth in NYC (B26). 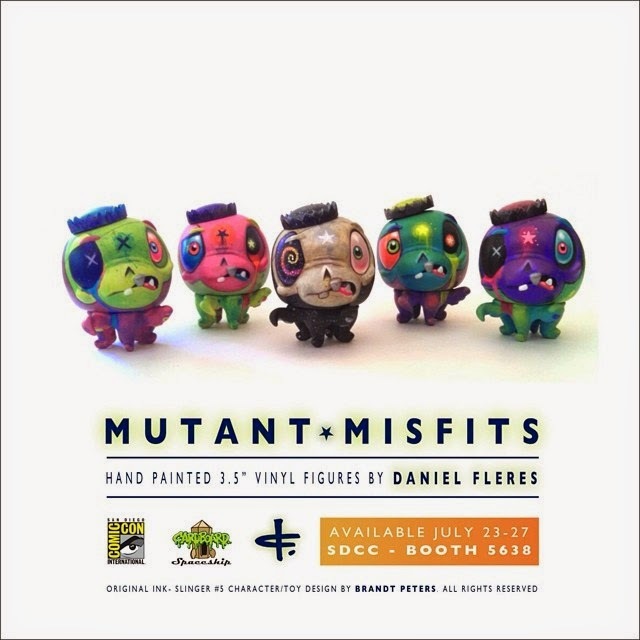 At SDCC 2014, Cardboard Spaceship is going to have a bunch of custom Wandering Misfit figures from a bunch of different artists, including Daniel Fleres. 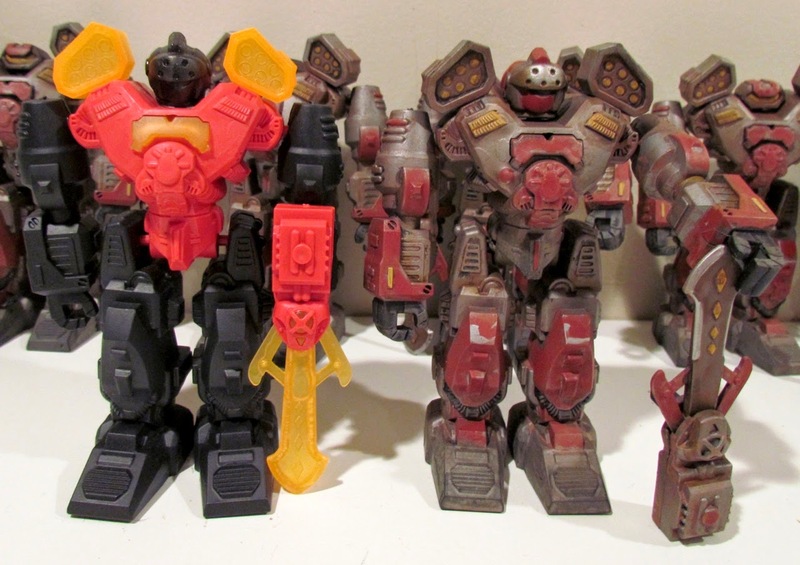 Originally launched at SDCC 2013, the Wandering Misfit series was designed by Brandt Peters and produced by Cardboard Spaceship. Daniel Fleres decided to focus on painting only the Ink Slinger figure from the series, making each one colorfully unique. Priced at $100 a piece, people will be able to pick these, and other custom Wandering Misfit figures, up at the Cardboard Spaceship booth, Comic-Con booth #5638. Any items not sold during the convention will most likely be made available on their online store shortly after. At SDCC 2014, Cardboard Spaceship is going to have a bunch of custom Wandering Misfit figures from a bunch of different artists, including Reactor-88. Even though Reactor-88 won't be in attendance at SDCC this year, his colorful totem style customs will be. Priced at $100 a piece, people will be able to pick these up at the Cardboard Spaceship booth, Comic-Con booth #5638. Any items not sold during the convention will most likely be made available on their online store shortly after. 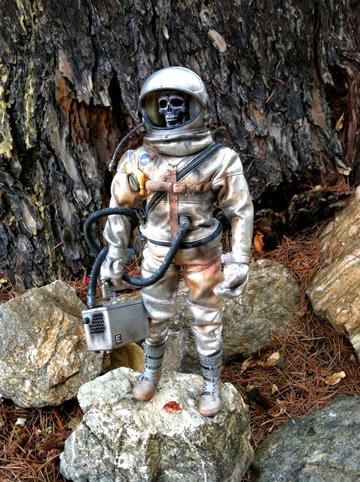 Christopher Avalos, aka Evilos, recently completed a pretty sweet custom Doctor Who "Vashta Nerada" 1/6 scale NASA Test Pilot figure. 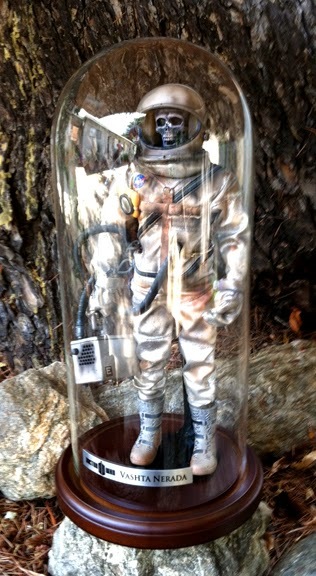 Contained within a 14" dome case, this custom Doctor Who 12" figure is currently for sale on Ebay for $499 plus shipping. Of course, a prospective buyer could always message Evilos directly to see if there is any wiggle room. 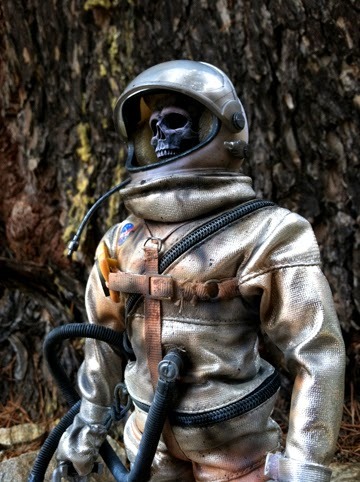 Turning the mostly white original figure into what looks to be a NASA pilot whose suit has seen some better days, was a great idea. In a mad scrabble by the United States to retrieve a malfunctioning spy satellite in 1960, Nasa secretly sent up the first human into space. An unknown test pilot code named 001 was tasked with the job. His mission, to retrieve vital intel and destroy the satellite before the Russians were able to. The Russians who were only a few months away from their own launch were well aware of what was going on and pushed their space program into full gear. Astronaut 001 was successful in getting to the satellite in record time. But what he found was unsettling to both the pilot and to NASA, his last transmission both scared and perplexed everyone. "Oh my God… the Shadows" was his last transmission and repeated for hours before the signal faded out. At this time the NASA Mercury 7 program had been in full effect trying to get back up into space to see what happened. In 1961 the Russians knowing the USA had sent up a human in secret, used this opportunity to send up publicly their own cosmonaut for political and propaganda purposes. 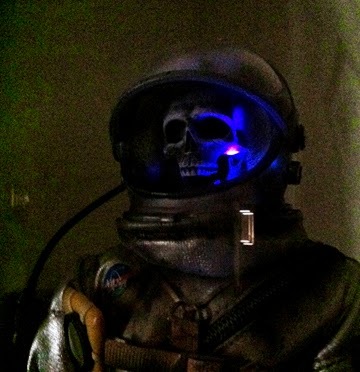 When Yuri Gagarin got to the satellite he found Pilot 001 in a "Zombie" like state which scared the hell out of him. Radioing back to Russia that the USA had some secret weapon up there. 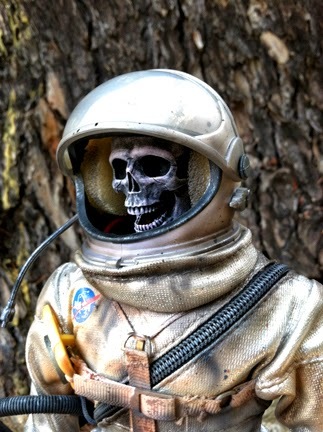 Not knowing that astronaut "Zombie" was in fact the alien entity "Vashta Nerada" which ate the test pilots flesh and was inhabiting his suit. At this point it was too late. Yuri had double shadows and an emergency escape mission was initiated. On his way down Yuri was over taken by the Vashta Nerada and was shot down by the Russians, who claimed reentry vehicle malfunction. Putting Yuri in the history books and Pilot 001 to burn up along with the spy satellite upon atmospheric reentry. For all those interested, be sure to hit up Evilos for more information on how to own this great custom. 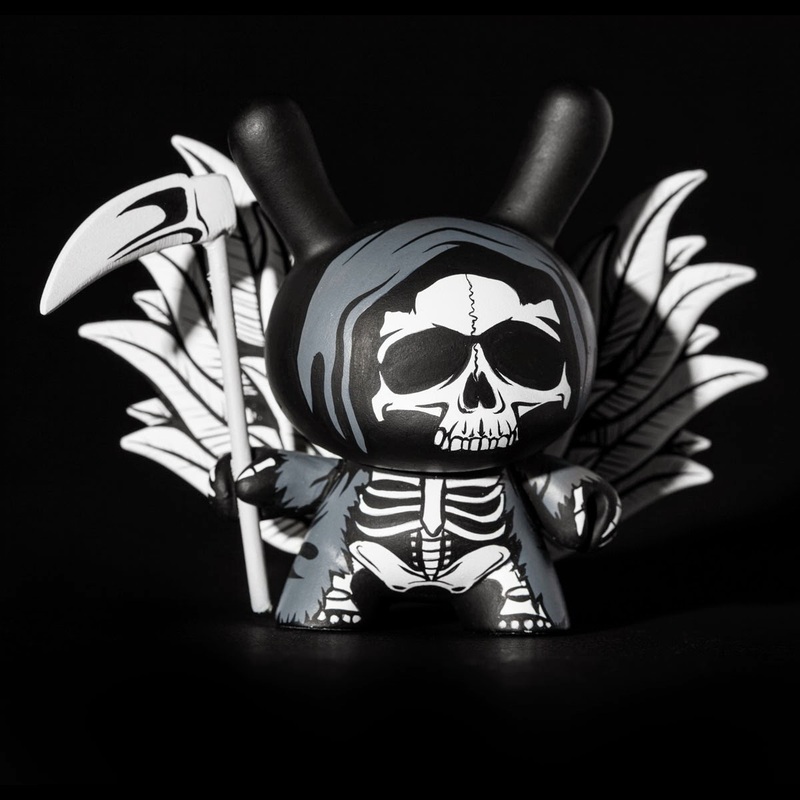 UK based artist Jon-Paul Kaiser recently completed an amazing 3" Dunny Commission titled "The Black Abyss in Death's Eyes". Jon-Paul Kaiser has been somewhat of a machine in the past year, since becoming a full time artist. Many collectors around the world are lining up to get on Jon-Paul's commission list. 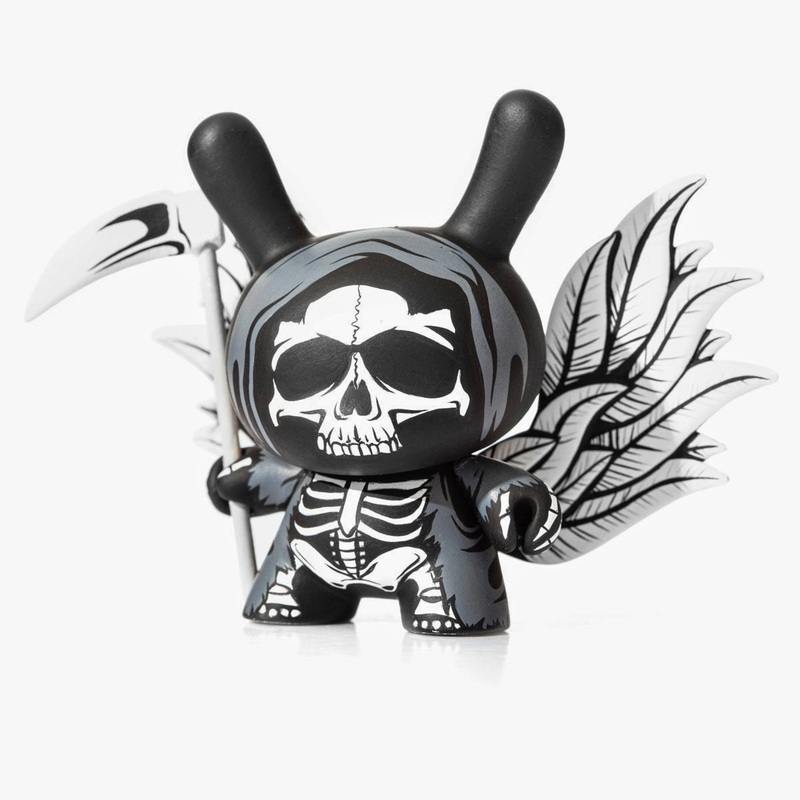 His latest creation is a detailed spectre of death, which was created using one of Andrew Bell's Dunny designs, from Kidrobot's Mardivale series, as a base. Jon-Paul Kaiser transformed the originally colorful Dunny into another monochromatic masterpiece for some lucky collector. As with most of Jon-Paul Kaiser's work, the completed Dunny was photographed by Justin Allfree. To hopefully get on Jon-Paul Kaiser's commission list, be sure to visit his site and shoot him an email with a request. Can't wait to see what other beauties are in store for the masses, direct from Jon-Paul Kaiser's workbench. SoKo Cat has customized Paul Shih’s 5” BEVIL like nothing you’ve ever seen before! Beware, broccoflower is coming your way! A corrupt kaiju, this one-off colorway has transformed our dreadful, devil vegetable into a delightful combination of broccoli and cauliflower: broccoflower! Don’t be fooled by his good looks, though. He’s just as vicious as his other colorways! This piece is available now for $60 in Soko Cat's store. Small Angry Monster decided to paint up some toy robots, giving them new life as The Rust Core. 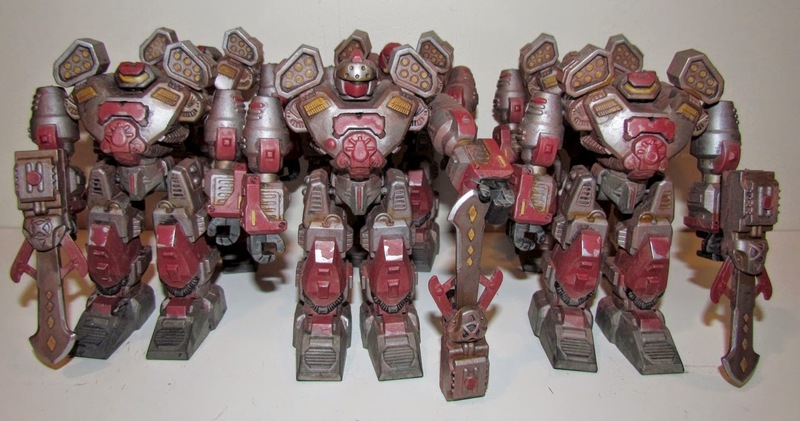 Available at 11am PST (2PM EST) on Thursday July 17 and priced at only $10 each plus shipping, these Rust Core robots will be limited to 6 pieces. 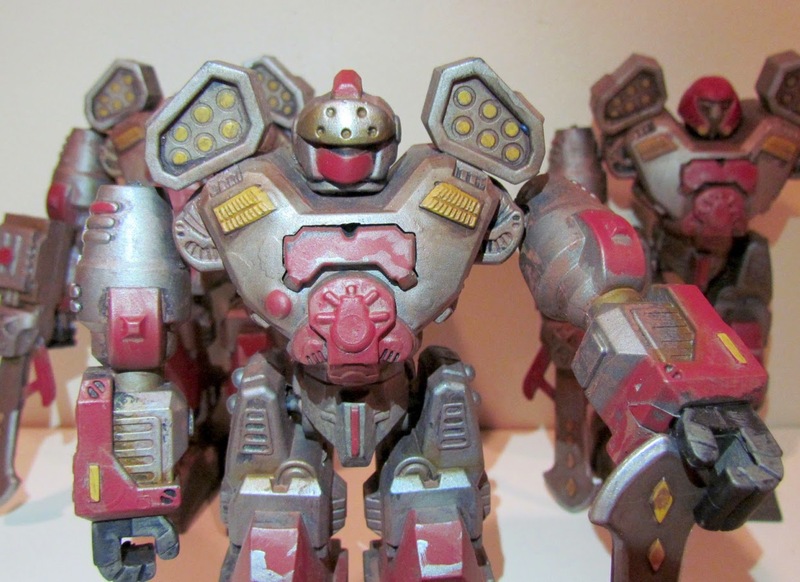 Each robot has been hand painted using high quality acrylic paint and weathered, giving the robots an aged feeling. 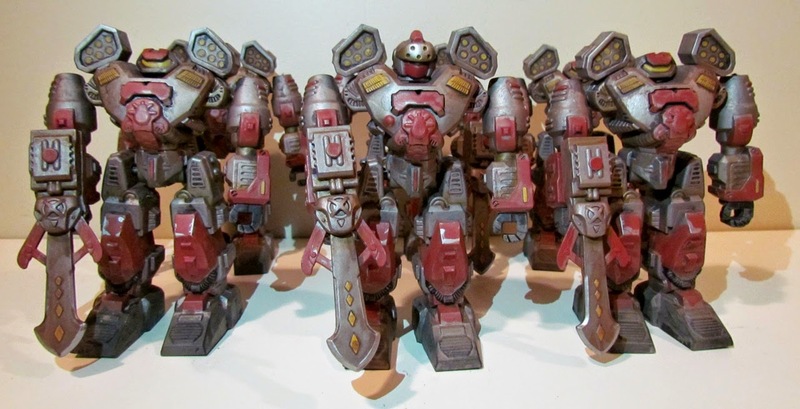 These robots will come blind bagged style, which will include one robot and one weapon. Each 6" robot is pose able with the limbs able to detach from the main body. 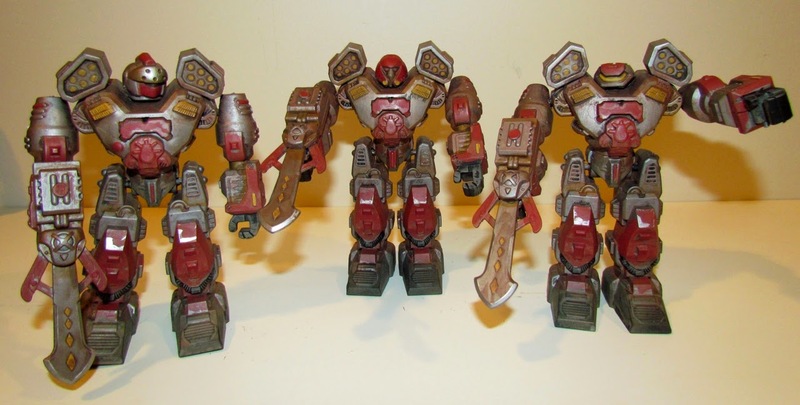 Great work by Small Angry Monster turning these robots into the Rust Core. Be sure to check out Small Angry Monster's work and available pieces while browsing the store. SoKo Cat has customized Peter Kato’s 3-inch and 2½-inch Bedtime Bunnies in this extremely limited edition release of only one of each piece! This release celebrates the summer, and this colorway incorporates bright, vibrant colors to these bunnies’ shirts and slippers! Even though it is a one-off, SoKo Cat is confident that she will return to Bedtime Bunnies with other new and exciting releases in the near future! The small Bunny is $35 and the large one is $45. 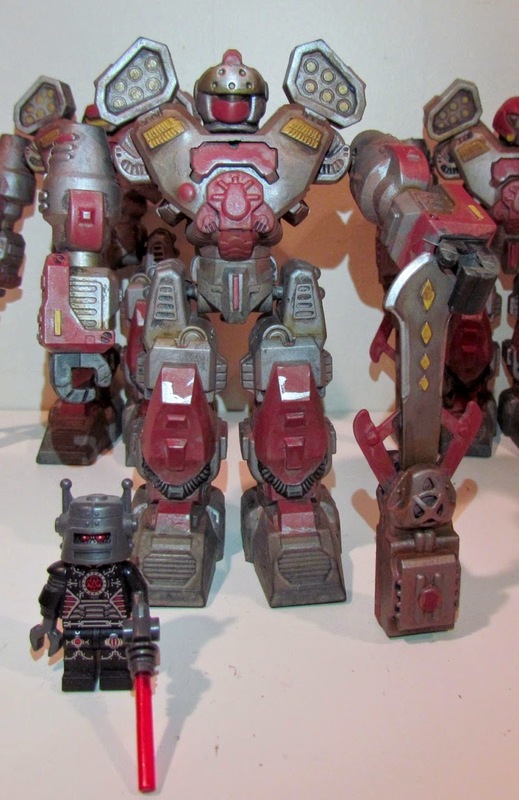 SoKo Cat’s weathering has modified Rotten Daughter’s otherwise unspoiled, well-oiled machine into a rusty robot. Still fully functional, this agitated android has been salvaged for his most important and prized part: his heart! Its return is unknown, but in the meantime, through rain, sleet, hail, and snow, our rusty, determined pal will patiently but forlornly await for his heart’s homecoming. This piece is available for $60 at Soko Cat's store. Ian Ziobrowski, Nugglife, recently completed some commissions, each using a 3" dunny as the starting base. 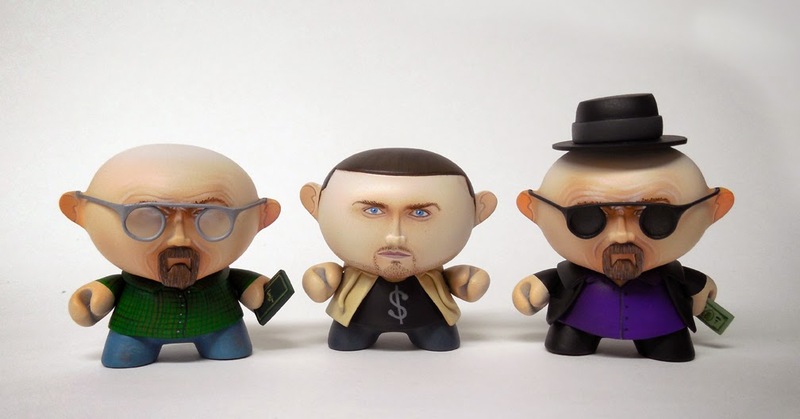 First up is a Breaking Bad set of 3 figures, 2 different Walters and a Jesse. 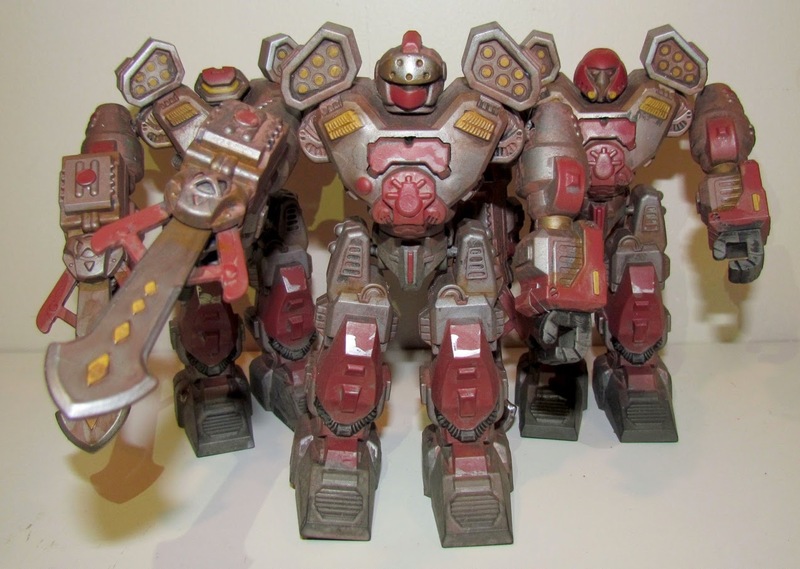 Each figure is hand sculpted and painted, with some amazing detail on such a small figure. Gone are the signature Dunny ears, replaced with sculpted ears which more resemble that of a human. 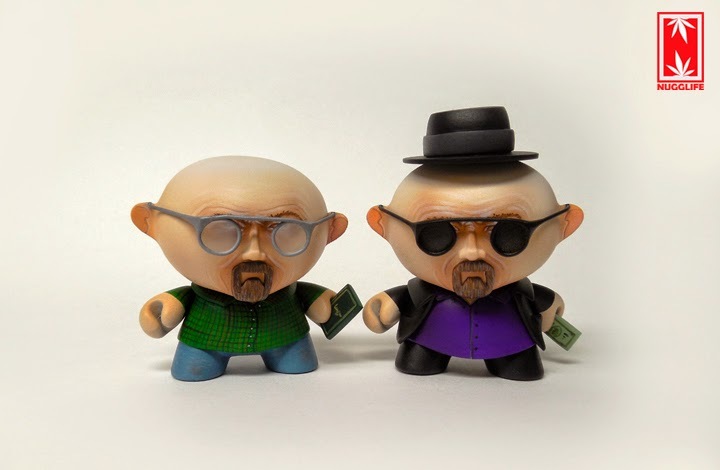 The two Walter White figures represent both sides of the famous Walter White character, the teacher and the drug lord, while the Jesse figure is just him. It's good to see that these characters were not created using the typical Yellow jumpsuit, but rather using the other recognizable clothing. Unfortunately for those BB fans out there who want this set for themselves, this was a commission. 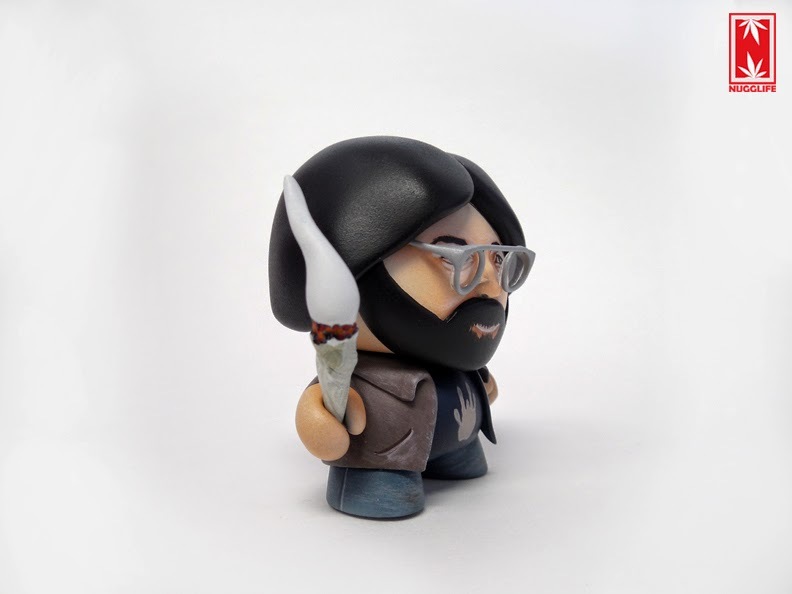 In addition to the Breaking Bad set, Ian Ziobrowski completed another 3" Dunny commission of Jerry Garcia. As always, the Dunny ears were lopped off to allow for a more human shaped head. 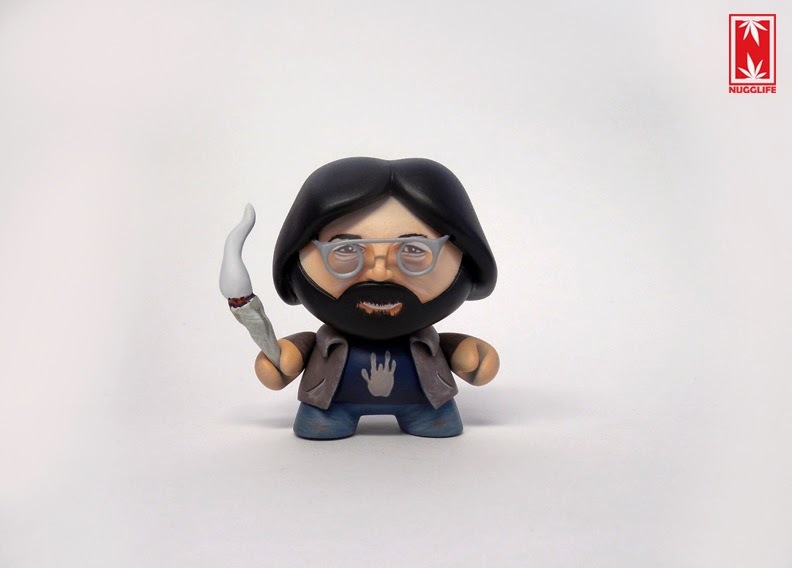 This figure is also hand sculpted and painted, which features Jerry in his younger years. 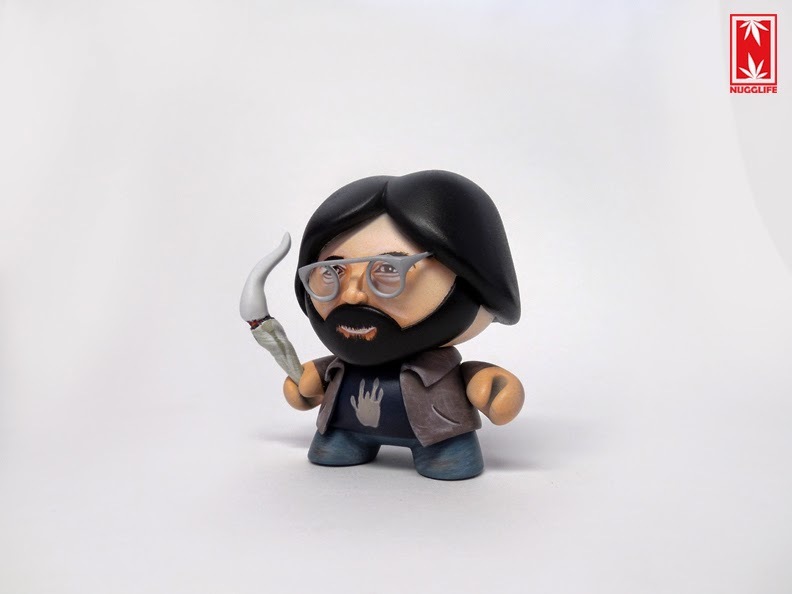 Holding a lit torch (not a torch), Ian did a great job emphasizing notable features of Jerry Garcia on such a small scale figure. For those who are interested in a commission, be sure to hit up Ian Ziobrowski and get on the list. 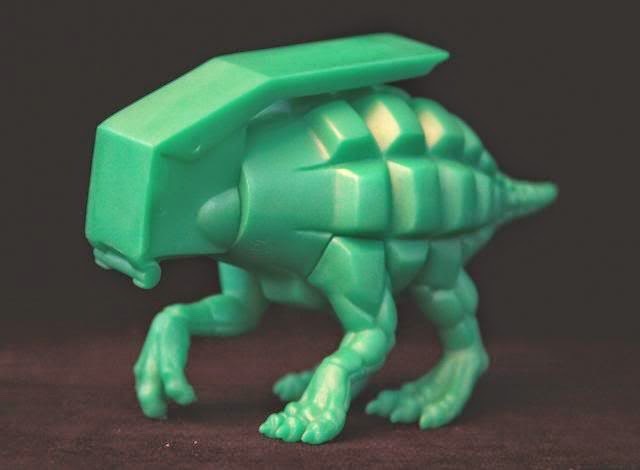 Ron English green Dinogrenade up for preorder now! 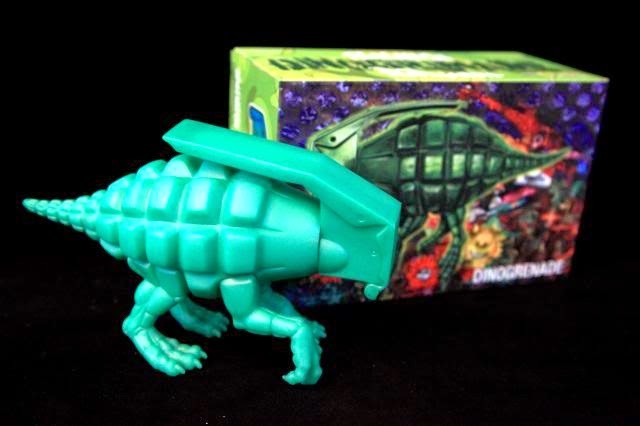 At 8 inches long, Dinogrenade is the Missing Link in the Evolution of Destruction! 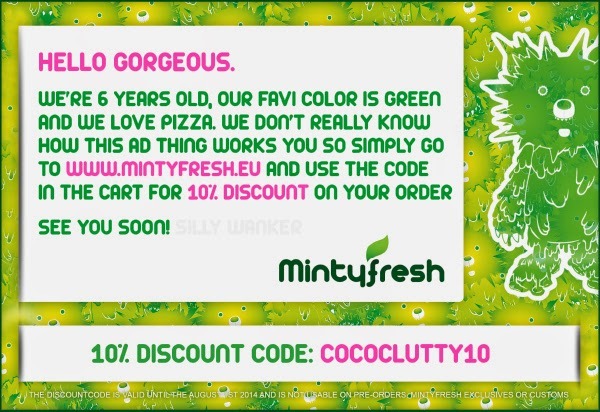 From now until August 1st, Mintyfresh is offering 10% off anything you order with the code cococlutty10. 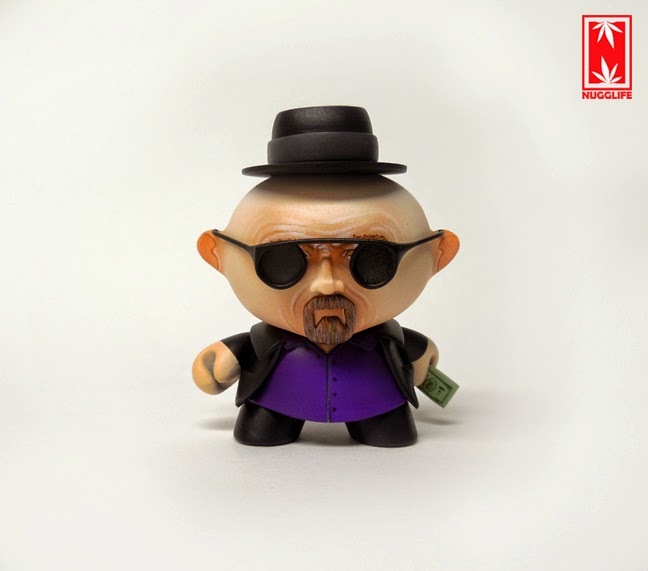 They have a range of products from designer vinyl toys, apparel and mimobots. This is the latest custom from davemarkart. 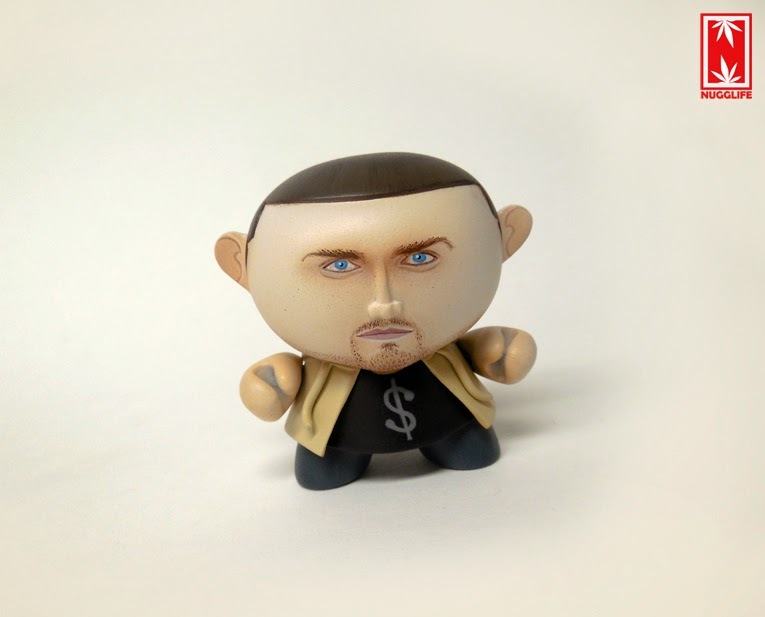 The piece was Sculpted with Super Sculpey on a 4" Munny base and hand painted with acrylics.It has a matte finish and is available now for $140 at the artists online store.